These are a little overgrown as Mike was out of town for over a week and I lost track of the garden. My mom was here while Mike was gone and I accomplished one million tasks (cleaning closets, dusting, doing laundry). 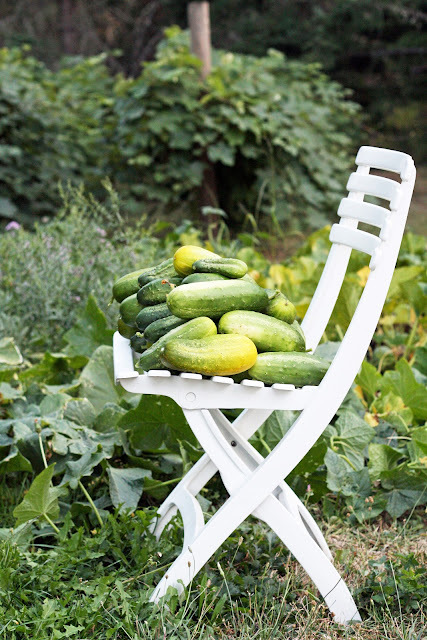 However, picking cucumbers wasn't one of them! Mike carved the babies' names into one of our pumpkins. It has become our tradition to make something special for the babies' birthday in December with pumpkins from the garden. Last year it was pumpkin pie, but this year it will be pumpkin cake - yum! We picked the last of the green beans. We slice fresh tomatoes on just about everything. One of my favorite ways to eat a summer tomato is to have it in a sandwich with avocado and lettuce. I ate about a million of these when I was pregnant with the babies. 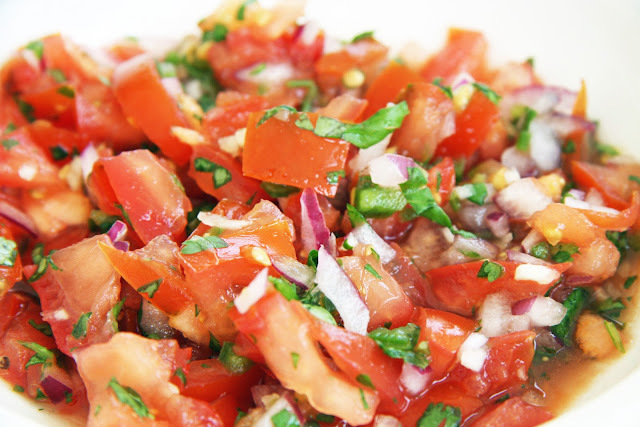 Another favorite tomato dish is fresh made salsa. I don't follow a recipe per se. I tend to use the taste test method - a method that can alter the serving portions significantly. Add more or less of one thing or another. And again, lots of taste testing! Your children are so precious- what wonderful sweet lil helpers! Your garden harvest was awesome, our hardly did a thing this year - just had a bad year for it with the drought and such. LOVE the photos. And Margaret's sweet curls! Can you believe this Indian Summer? Glorious. Beautiful photos, adorable children, scrumptious vegetables. An all-around lovely post! these photos are so cute... we have just planted our spring crop and only hope our vegies are half as luscious as yours. What a nice post! Your little ones -- who are getting so big -- are adorable! And Margaret has such pretty, dark hair. 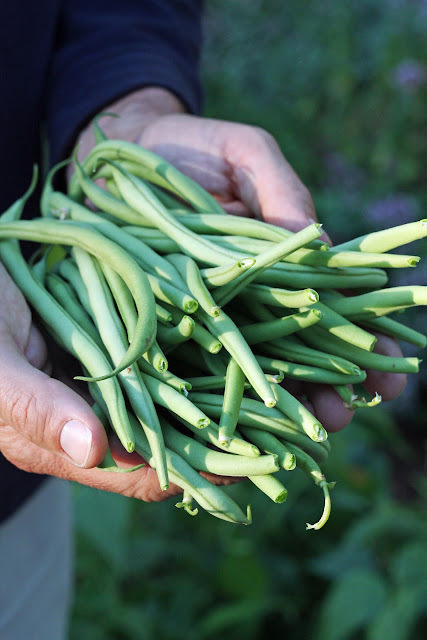 The bounty from your garden looks delicious, especially those beautiful green beans and tomatoes! Your salsa looks yummy. you know, good roll ability for tomatoes is always the first thing our 10 month old Lab puppies look for too, then, it's right to the squishy part. They are both beautiful children, thank you for sharing and making my day start with a smile, I love finding your posts first thing in the mornings. Your children are absolutely adorable. Your images remind me of when my teenage children were small. Your tomato favorites are ours as well. I really need to think about putting in a garden plot. Hmm. Something to ponder. I am loving your daughter's hair. I cannot wait for my 14 mo daughter's to get that long! How delightful. I would love to come visit your garden one day and paint your lovely fruits and little laborers. 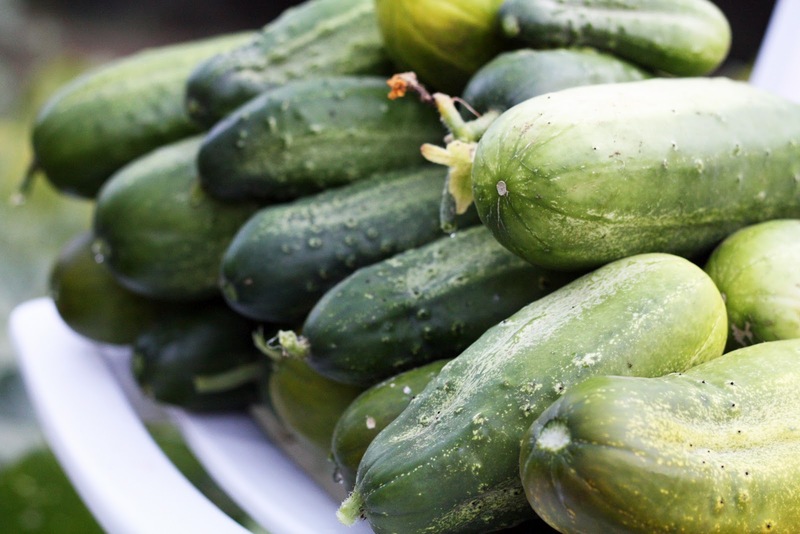 I just adore cucumbers....salads and a famous cucumber spread....an old family recipe. I love, love, love the tradition of the birthday pumpkin! I was wondering not long ago how it was growing. Lucky you have such precious little helpers! I use the same method for making salsa! We've had a salsa garden for the past two years, tomatoes and peppers seem to be the only things we are good at growing. I love that your kids are helping and your daughter's outfit is adorable! Wow what a crop! Those are alot of cucumbers. I love cucumbers. Slice them up and put them in water they make a refreshing drink. Love seeing Graham inspecting everything. And Miss Margaret is truly lovely in her sundress. Hee Hee. Beautiful garden, beautiful children, beautiful life! You are so very lucky to know how to make it so. It is the end of winter here but we have been eating tomato and avocado sandwiches lately.. often .. okay, for dinner ! I love avocado and never get tired of it. I can't wait til we get settled back in the US and I can have a vegetable garden. If it is only tomatoes I would be happy. Love it, Love it love it! Thanks for your inspiration. Something to try is growing cherry tomatoes, I grow them specifically for my little ones to snack on when their outside playing, and sure enough they gobble them all up. That salsa looks divine. For an extra flavor punch, toss in a clove of minced garlic and the juice of a lemon. The flavors mingle so well together and seem to just pop. You should look for the recipe, Tomato Jam! Seriously, it sounds horrible...but it is one of the best new recipes that I found online this year! Your babies will love it! Perfect replacement for catsup and can be used in numerous other ways. Love your beautiful pictures! Seeing your twins reminds me of my twin girls (8 now) when they were toddlers. :) They kept me busy - so I'm sure you are as well! My husband and I bought a 160 year old home in March and have been fixing it up with our kids' help. Your photos and posts about your house have been so inspiring and helpful. I especially love the porch off your dining room - lovely! Lovely photos and lovely children! Love the carved pumpkin! Just curious as to where you shop for little Margaret?? She wears the most adorable clothes! 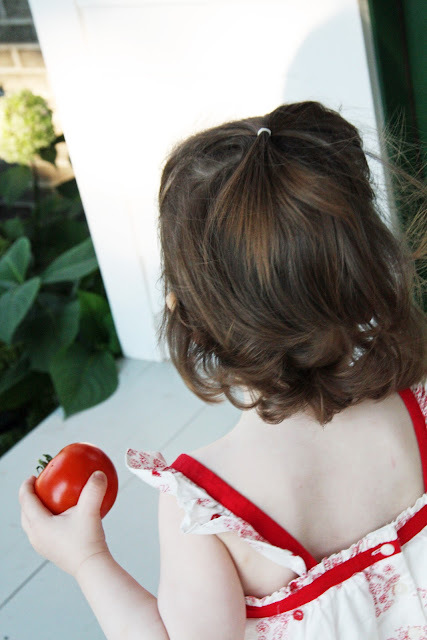 I love tomatoes with avocado too, but who can pay attention to that when there are such adorable children to look at? That red and white dress is darling. Your son is delicious. Love the idea of a birthday pumpkin pie. I would love to just move into your life. That hair on Margaret, such darling curls. And Graham's little legs. And that veggie patch. And the home. I so love reading your blog. 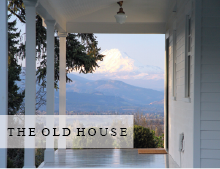 I read it all in a few days and then look for your updates -- and I had seen your house in the magazine and loved it before I ever put two and two together. This little lady bug dress came from The Gap. The yellow dress in the previous post is also from The Gap. Everything looks so incredible. All the work that goes into a garden is totally worth it when you have beautiful produce like that right in your own backyard! What sweet pictures of you sweet kids. 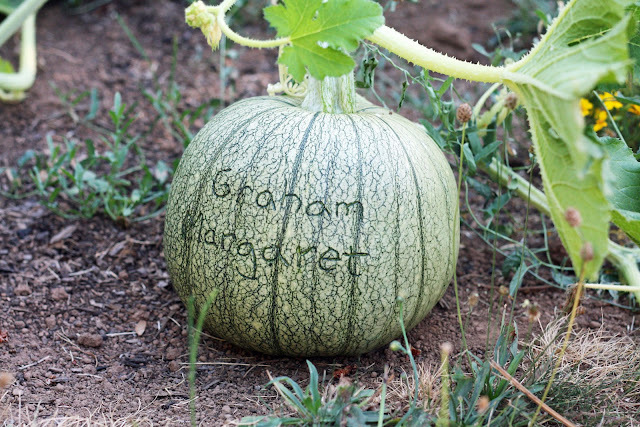 The personalized pumpkin is such a great thing to do. Love the birthday tradition! What cutie little garden helpers. I'd probably garden well into the fall too if I had hired help like that. Although manhandling my tomatoes...we might have to have a talk about that. Adorable little helpers. My, I really wish I have a garden, the joy of freshly picked and served produce is priceless. Got my eye on your next posts. I read a description by her eldest son on A-M's blog that fits your children to a T: "They're so sweet you could eat their cheeks!" I love your home posts and your "Mommy blogger" posts, too! I love your blog! Watching your children grow brings back so many memories of watching my own 3 boys grow up. Your house is beautiful and your photography is beautiful. Thank you! the babies are not so much babies anymore....everytime I come by, they have grown more! I know you guys are enjoying them so much!!! What a blessing they truly are! Just catching up on some blogs and as ever your photos are beautiful beyond words and your two little people are a slice of heaven.